Due to rough weather, we missed our scheduled stop in Miami. As good luck would have it, we ended up passing by Miami just at sunset. I took a series of sunset shots that were quite remarkable. After I returned from the cruise, the realization came together that I had collected time-stamped GPS track data along with time-stamped photographs. With a little help from a very old program called SkyGlobe and a calculator for distances and bearings, I was able to assemble the required information to build this map. The marker is Grandeur's position when I took the photograph above. The white line is Grandeur's course from about an hour before to about two hours after the picture was taken. 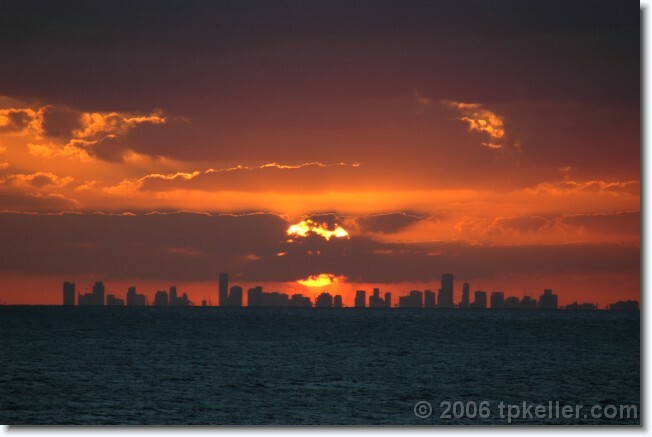 The yellow line is the approximate bearing of the sun as it is setting, which shows us what part of the Miami skyline is visible in the picture. The bearing is not exact, but does get us in the general area. Updated November 29, 2006. Comments?